From a business standpoint the WSOP 2013 has been hugely successful so far on the NL Holdem side of things. 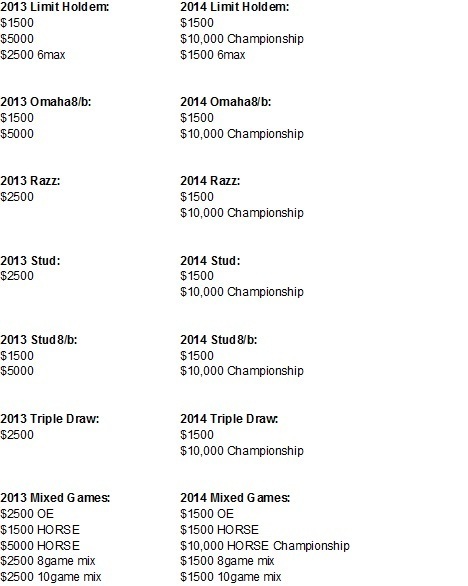 The WSOP has done so many things flawlessly over the last few years to make it the event that it currently is. The Millionaire Maker blew away expectations and each NL field has been tremendous. While the turnout has been great it has not transferred over so well to the limit and mixed game events. The WSOP needs to look hard at themselves when figuring out why this is the case. It is certainly not because the mixed games are dying and the WSOP is just a casualty of a much bigger worldy trend. That would be just an easy excuse to write off the downward slope in numbers. The fact is there are more mixed games and or limit games being played around the world on a daily basis than ever before. So why are the limit and mixed events at the WSOP not also growing in conjunction? I believe it is a problem that can easily be fixed. The mixed events offered at this year’s WSOP are designed with the severe flaw of trying to do too much as a middle ground for what players’ want. The WSOP needs to rid itself of $2500 and $5000 events in the mixed games arena. Each discipline of the mixed games should have a $1500 event and also a $10,000 championship event. There is a huge psychological barrier when the entry fee jumps from $1500 to $2500 in any event. We lose many amateur players who are such a large percentage of the field without that jump in price. Many casual poker players will take a shot for $1500 in a discipline they feel less than confident about but will not take a shot for $2500. There is an invisible barrier there that is not easily definable but is there nonetheless. The fields would be dramatically larger at the $1500 level and the prize pools would always follow. I am convinced by having a $1500 event in any discipline of the mixed games would spur continued growth year over year for any limit event. I would really like to see that begin for the WSOP in 2014. The $5000 events do not attract many players that would not also play the exact same event at a $10,000 buyin instead. In fact an overwhelming majority of the players in a $5000 mixed game event would prefer to have the buyin priced at $10,000. All the WSOP accomplishes by having $5000 events in place of the $10,000 is to greatly reduce the prizepool and in turn reduce interest from the poker community. A $10,000 Stud might only get 80 players. A $10,000 Omaha H/L might only attract 170 players. But these small fields are not a bad thing for the WSOP. This would bring the romance back into these ‘Championship’ events. These final tables will be full of superstars which is what the mixed games and the WSOP both need. There is something special about a 10k that can’t be duplicated with a 5k no matter how you cut it. $1500’s and $10,000’s each serve a great purpose and each do it well. $2500’s and $5000’s try to do too much and wind up doing nothing to benefit the long run. $1500’s produce large participation and build new interest in each discipline. $10,000’s bring the intrigue and puts our stars on the stage. This is a win win plan. Win for the players. Win for the WSOP brand. If you would like to see this happen please tweet @wsopSUITd (Ty Stewart) & @wsopTD (Jack Effel) ‘The WSOP 1500/10k Plan’ to let them know. Also if you have any ideas on how to improve this plan you all know where you can find me any day and every day over the next few weeks. Totally agree, Matt. Well said. 1) Two starting days A + B for the seniors event. How hard can that be? 2) A Senior $10,000 bracelet event - how many older serious players/professionals can survive the minefield that such a large field represents? It's too much a gamble with such small starting stacks 3000 chips. Would make a great ESPN TV event since the players featured would be players with long poker histories. 3) A "Super Senior event" - at $1000 for poker players over 60. Dont forget to ask for sats. and mega sats. featuring the respective versions of each game before the events start. Boston here. I looked forward to playing several events this year. When the schedule revealed only one 7 card stud tournament, I played that and the seniors. My protest means nothing, however, I heard Daniel agrees with you and explained to them that unrelenting nlh tournies, does not keep the spirit of poker alive. I am happy that players with relevance are telling Harrahs, that short term greed will lead to long term failure. I hope they listen. Thanks for writing something. Obviously I am in the minority in my desire for 7 stud tournaments. That does not mean I am wrong. I hope they listen. If they do, I hope we meet at a final table. Be good and best of luck. As a professional with limited non-hold 'em experience, I too would prefer lower buyins on those games. I think there are a lot of pros like myself who enjoy playing the other games but know that we aren't world-class at them. Even if the composition of the field were the same, I could much more easily justify buying in for $1500 than $2500 to an event that I know I will enjoy but where my edge will not be as large as it would be in a NLHE tournament. Of course knowing that the $1500 will also be a larger field only makes this a stronger preference. Thanks for pushing this issue, Matt, I think you're right on. From a poker fan who reads updates on who made final tables I completely agree. This year I find myself not checking as often because I don't recognize many names. It just hasn't felt as "special" for some reason. And what about the women? C'mon ladies lets see more of you at final tables. Boring so far this year.